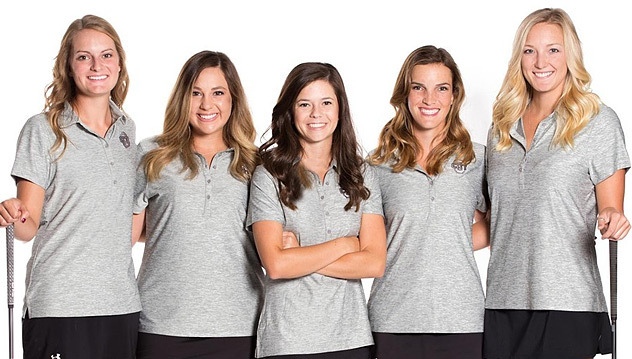 The Oklahoma City University women’s golf team returns six all-Americans from last year’s team looking to better its 2015-16 season when the Stars won the Sooner Athletic Conference championship and finished seventh in the NAIA. OCU starts the spring as the No. 2 team in the NAIA women’s golf rankings. The Stars have a challenging schedule to prepare themselves to vie for the program’s eighth national championship. The Stars are set to open the spring season Sunday in the Claud Jacobs Invitational at the Club at Colony Creek in Victoria, Texas. The Stars won the Claud Jacobs for the third time ever last season by 30 strokes. Caroline Goodin of the Stars is the defending champion, while Emma Allen finished as runner-up then. Every team member is expected to play in the 36-hole tournament on the par-72, 5,856-yard course Sunday and Monday. No. 12 Texas Wesleyan will be the other ranked team in the seven-team field. OCU won two tournaments in 2015-16 and seized the SAC championship for the fifth straight year. The Stars finished 16 strokes behind national champion Keiser (Fla.) in seventh place in the NAIA Championships at the Savannah Quarters Country Club in Pooler, Ga. The Stars were only six strokes back of second-place William Woods (Mo.). The 2017 NAIA Championships are held at the PGA National in Palm Beach Gardens, Fla., on May 23-26. OCU finished fifth and sixth in the first two tournaments of the 2016 fall season and were able to cap the season off by winning the Susie Maxwell Berning Classic. The Stars set an OCU record by winning the classic by 32 strokes. Anna Mikish, a junior from Choctaw, Okla., shot a 71-71-75–217 to earn the individual crown. The Stars return a wealth of talent from last year’s squad. In total, six of OCU’s nine players have garnered all-American honors in their careers. Caroline Goodin earned first team all-American honors along with Mikish last season. Goodin, a senior from Oklahoma City, shot 79-73–150 for a share of 20th place in the NAIA Championships. She took home the individual title at the SAC Championships and had an average score of 77.69 in 12 tournaments last season last season. The two-time NAIA first-team all-American had averaged a 79.5 in six rounds this fall. Mikish finished tied for 26th at last year’s NAIA championship with a card of 79-74–153. She was named a second-team all-American in 2013-14 and 2014-15 after finishing 20th and 18th, respectively, at the national tournament. In addition to Goodin and Mikish, the Stars also return seniors Raegan Barnes, Kailey Campbell and Katie Lee-Wilson along with junior Emma Allen. Barnes, from Choctaw, is one of four returners who competed for OCU at the NAIA Championships last season. She turned in a seventh-place finish individually at the SAC Championships last year and had an average score of 81.00 in 23 rounds of golf. She competed in all three tournaments in the fall for OCU, recording an average score of 79.22. Campbell, out of Oktaha, is a three-time NAIA all-American. She took home second-team honors in 2013-14 and 2015-16 and was an honorable mention on the Stars’ 2014-15 squad. She had an average score of 77.78 and finished in the top 10 in four tournaments last season, including a third-place finish at the SAC Championships. Campbell averaged 76.00 shots per round in nine rounds in the fall and took home second place at the Missouri State/Payne Stewart Memorial. Wilson, from Owasso, averaged an 81.26 in 10 tournaments last season. She is a two-time NAIA all-American, picking up third-team honors and second-team acclaim in her OCU career. She did not compete for OCU in the fall, but expects to return to the course for the spring semester. Allen, of Broken Arrow, is another returning all-American for OCU, garnering first-team honors as a freshman. She finished in the top 10 in each of her final three tournaments last season and averaged a 78.11 in 10 tournaments. She finished third in the Berning Classic with a 75-70-79–224. It was the only event she competed in this fall. New to the Oklahoma City squad this season are freshmen Melissa Eldredge and Regan McQuaid along with junior transfer Savannah Moody. Eldredge comes to OCU from Eufaula High School. She was the fifth-ranked player in Oklahoma her senior year of high school. She averaged 75.00 strokes per round in her junior season at Eufaula. In the fall, Eldredge played in all three tournaments for the Stars, turning in an average score of 79.89. McQuaid, out of Tulsa, attended Jenks High School. She was named to the Oklahoma Coaches Association all-state team as a senior. McQuaid competed in one event this fall and carded an average score of 83.00. Moody, from Aledo, Texas, comes to OCU by way of McLennan (Texas), where she was an NJCAA all-American. She also finished 17th individually and helped McLennan to a third-place finish at the NJCAA Championships. This fall, Moody had an average score of 77.00 in nine rounds. Five players remain from the 2014 national championship team. The Stars own national titles won in 2005, 2006, 2007, 2008, 2009, 2013 and 2014. OCU took SAC titles in 2001, 2003, 2004, 2005, 2006, 2007, 2008, 2009, 2010, 2012, 2013, 2014 and 2015.